Undefeated Cathryn Sophia Collects Ten Oaks Trail Points: Having won her first two career starts by a combined 29 lengths, Cash is King LLC’s Cathryn Sophia was sent to post for Saturday’s $200,000 Forward Gal (G2) at Gulfstream Park as a prohibitive 1-10 favorite. The daughter of Street Boss may have only won the seven-furlong stakes for 3-year-old fillies by 5 ½ lengths in her graded-stakes debut, but the manner in which she overcame a tardy start and subsequent traffic to overwhelm her competition with the utmost ease made Saturday’s performance particularly special. Cathryn Sophia had previously won her first two starts for fun, winning her debut by 12 ¾ lengths at Parx Oct. 20 and capturing the Gin Talking Stakes at Laurel Park by 16 ¼ lengths Dec. 5. The Maryland-bred filly was never threatened during those front-running performances, but she broke a bit slowly Saturday to sit fourth of six horses midway along the backstretch. She advanced quickly to gain striking distance behind the pacesetter, Island Saint, who was pressed on the outside by Ballet Diva around the turn and into the stretch. 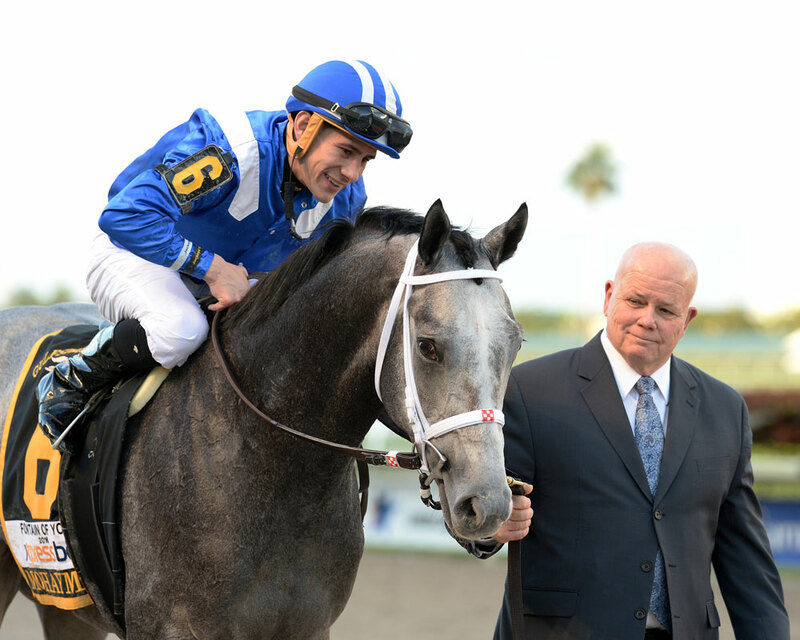 Jockey Joel Rosario angled Cathryn Sophia off the rail and she responded with a burst of speed that propelled her to a dominating victory without urging. Cathryn Sophia ran seven furlongs in 1:22.04. Island Saint, the 5-to-1 second choice ridden by John Velazquez, held second, 4 ¾ lengths ahead of Ballet Diva and jockey Jose Caraballo. The winner’s performance was even more impressive considering she raced somewhat greenly in the stretch, switching leads a second time after suddenly finding herself on the lead with nothing but daylight in front of her. Cathryn Sophia was purchased by Cash is King LLC for $30,000 at the 2014 Fasig-Tipton Mid-Atlantic September sale. After Cathryn Sophia successfully stretched out to seven furlongs under less-than-ideal conditions Saturday, Servis is confident that she will handle the one-turn mile of the Davona Dale without a problem.